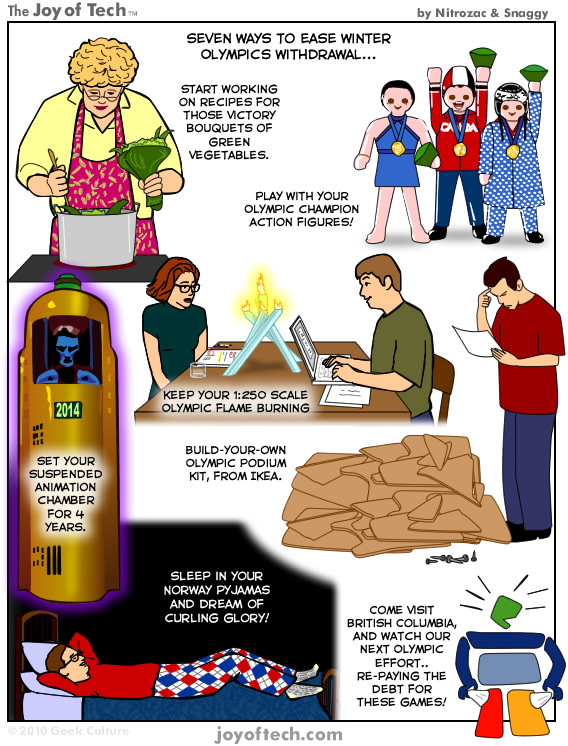 The Joy of Tech comic... 7 ways to ease Winter Olympic withdrawal. So, how did you like them winter Olympics? Fantastic, I can't wait for the next ones! I wish my team won more. Glad it's over, I can't wait for my favorite TV shows to come back. I'm glad they are over, my Olympic addiction was threating my non-jock status. geekygoddess is burglarized and Karma is a beyotch!! !, ... TheMoMan thinks he knows why, ... littlefish is reminded of the World's bravest people, ... GameMaster explains While I was out, ... and Snaggy is Standing.